Development of the lake A162 (−72.78W, −13.20S, 4573 m asl., Cordillera Vilcabamba) in the period 2006–2017. Imagery: CNES Airbus/Digital Globe (Google Earth), Drenkhan et al. 2019. In the Andes of Peru and adjacent arid lowlands, human subsistence often depends on year-round streamflow from glaciers and lakes, particularly in the dry season. However, global change impacts increasingly affect local hydrology and associated livelihoods which is clearly demonstrated by the impacts of glacier shrinkage. Rapidly growing lakes (Fig. 1) in deglaciating mountain regions potentially imply severe risks but also options for human livelihoods. On the one hand, seasonal water scarcity and Glacial Lake Outburst Floods (GLOF) pose a serious threat for highly exposed and vulnerable people. In addition, water demand is growing due to increasing irrigated agriculture, population and hydropower production. On the other hand, future lakes bear important options for integrated disaster risk management (IDRM) and for integrated water resources management (IWRM) potentially attenuating deglaciation-driven discharge variability and scarcity. Additionally, new lakes could offer important attractions for tourism. In this context, a recent study has been published led by University of Zurich in collaboration with CARE Peru within the framework of the ‘Glacier Project+’, an initiative by the Swiss Agency for Development and Cooperation (SDC). 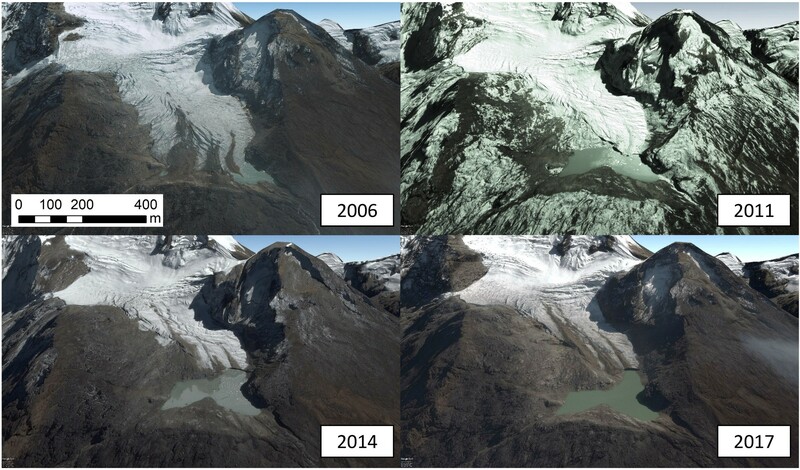 This research combines current and future glacier and lake trends with potential water risks and management options in the Vilcanota-Urubamba basin (VUB), Southern Peru. The VUB represents one of the most extensively glaciated areas in the tropical region worldwide and is characterized by traditional livelihoods as well as increasing water demand driven by population growth and urbanization, irrigated agriculture and tourism which also includes the Inca citadel of Machu Picchu. Fig. 1: Development of the lake A162 (−72.78W, −13.20S, 4573 m asl., Cordillera Vilcabamba) in the period 2006–2017. Imagery: CNES Airbus/Digital Globe (Google Earth), Drenkhan et al. 2019. The GLOF susceptibility and potential reach of damaging flow of current and future glacier lakes were analysed with the Modified Single-Flow-direction (MSF) model. Eighteen out of 134 current and another six out of 20 future glacier lakes were identified as potentially highly susceptible to GLOF. A total of eight existing and one possible future lakes indicate very high risk potentials. Furthermore, a comprehensive surface water balance scheme for five selected subcatchments reveals that future river discharge could be reduced by some 2–11% (7–14%) until 2050 (2100). Particularly in headwaters and during dry seasons, glacier contribution representing roughly 15–25% to total streamflow is crucial and would substantially decrease to below 4–22% (1–3%) until 2050 (2100) with strong glacier shrinkage under intense warming (scenario RCP8.5). In the middle and lower basin, long-term water availability could be jeopardized by growing irrigated agriculture and hydropower capacity. Combining a GLOF and water shortage risk assessment, three key hotspots (02-PT, 03-CC and 04-AST – see also Fig. 2) of current and future water risks were identified. Fig. 2: MSF modelling results for areas potentially affected (APA) under maximum GLOF reach (2–3°) for selected (a) current and (b) future critical lakes in the five selected subcatchments (01-SS=Salcca–Sibinacocha; 02-PT=Pitumarca–Tigre; 03-CC=Ccochoc–Chicón; 04-AST=Aobamba–SantaTeresa; 05-RH=Runtumayu–Hualancay). Selected lakes with (very) high risk are labelled (current lakes: L103, L162, AC= Azulcocha, QC= Qomercocha, SP= Sisaypampa; potential future lake: AG= Ausangate), Drenkhan et al. 2019. In the context of shrinking glaciers and growing glacier lakes, several options arise for long-term water management. These include lake damming, ancestral initiatives on small and decentralized water infrastructure and multi-purpose use of water across different sectors (e.g. hydropower, agriculture, households and tourism). This is particularly interesting in the study region where recently a Water Resources Council was established within the framework of the new Water Resources Law in Peru. This new water architecture promotes and intersectoral and sustainable water use coordination among different stakeholders, such as regional and local governments, agricultural users and peasant communities. Therefore, the identification of water risk hotspots and long-term implementation of adaptation measures within a participative process would, thus, represent an important step to mitigate and contain social conflicts over water which have a long-lasting history in Peru and hamper sustainable water management. Guardamino, L., Haeberli, W., Muñoz, R., Drenkhan, F., & Cochachin, A. (n.d.). Modelled glacier-bed overdeepenings and possible future lakes in the Cordilleras of Peru.